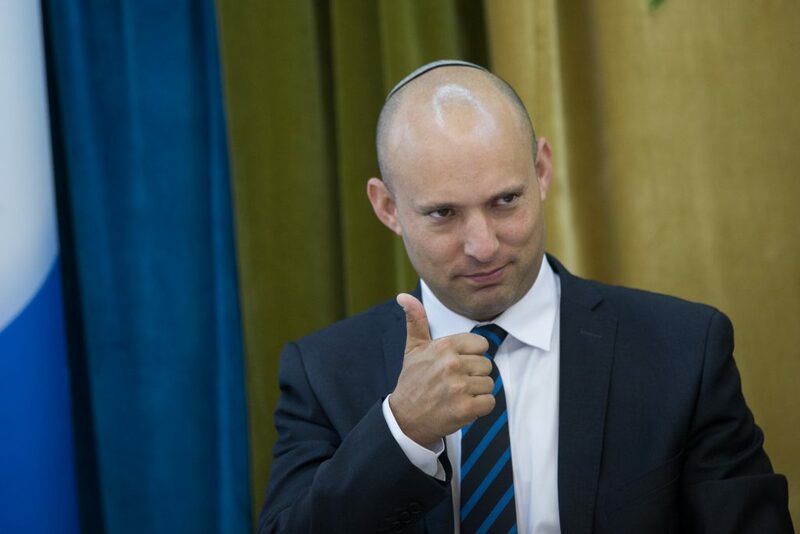 Naftali Bennett, Education Minister and Jewish Home party chairman, has begun maneuvering for possible early elections in the event Prime Minister Binyamin Netanyahu is forced out of office by corruption charges. Mr. Bennett on Wednesday requested that primaries in Jewish Home be moved up, likely to be held soon after Pesach, according to sources. A meeting of party officials was scheduled for Thursday night to take up the matter. Arutz Sheva carried an unsourced story on Wednesday which said that Mr. Bennett hopes to take advantage of Mr. Netanyahu’s departure, when he believes Likud will lose strength dramatically as Jewish Home rises, to engineer a merger of the two parties for the next elections. Such a merger, like the Likud-Beiteinu merger a few years ago, could defeat Yair Lapid, whose Yesh Atid party has been surging in the polls. Support for Mr. Bennett’s candidacy was already being voiced by other Jewish Home leaders. “Our candidate for prime minister after the Netanyahu era is Naftali Bennett. He is the best person for (the job)… and I call on the public to join the party, vote and be counted,” Justice Minister Ayelet Shaked said Wednesday. On the other hand, should Mr. Netanyahu be vindicated, the next officially scheduled elections will not be held until his term runs out in 2019. In the meantime, Mr. Bennett and others, including Transportation Minister Yisrael Katz (Likud) and former Defense Minister Moshe Yaalon, who says he will head a new party, have declared their intention to run for prime minister whenever the post-Netanyahu era commences. Likud MK Avi Dichter contended over the weekend that Mr. Netanyahu could no longer discharge his duties as prime minister while allegations of corruption hang over him. Mr. Dichter said he intends to run for the Likud leadership in the future. Movement was seen in other parties as well. On Tuesday Yesh Atid announced the addition of seven mayors at a press conference. Last month, Meretz head Zehava Galon said she has decided to introduce open leadership primaries in her party.